This PCIe Add on Card extends your systems RS422 or RS485 serial device connections by 8! 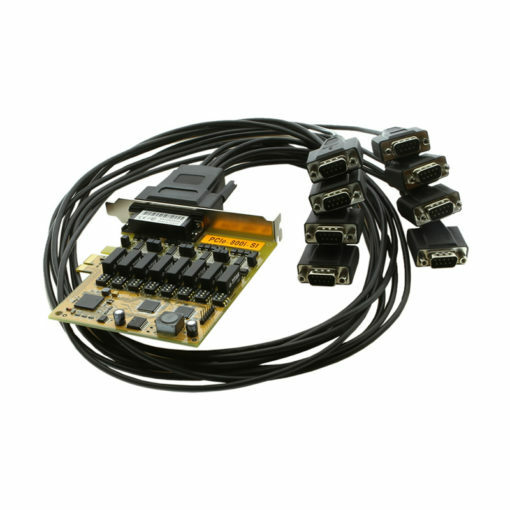 Using this PCI Express Card interface and a DB44 to DB-9(8x) octopus cable connection enables Optical Isolation, ESD, and Surge protections to you serial signal devices. All cable connections are screw lock mechanisms for secure point to point contact. 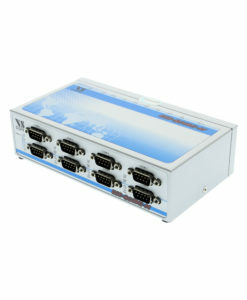 PCI Express 8-port industrial serial I/O card is a plug & play high-speed serial I/O expansion card for the PCI Express bus. 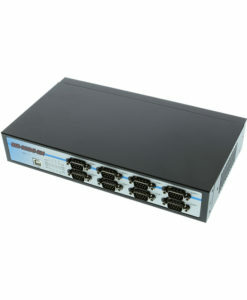 Connecting to a PCI Express bus on your computer, the PCI Express 8-port industrial serial I/O card instantly adds eight RS-422/485 serial I/O communication ports to your system. The PCI Express to 8-port industrial serial I/O card provides optical isolation and 3000 Volt DC optical isolation and are designed to support high-speed serial port data rate up to 921.6K bps. Each serial port is fully compatible with 16C550 UART, with enhanced feature of 256 bytes TX and RX FIFO buffer for higher performance.